Lovely 4th floor Sandy Key hideaway with spectacular views of the world's most beautiful beaches! Sandy Key’s beaches are forever protected by the neighboring National Seashore Preserve. If you prefer your walks on the beach, solely in the company of the sea gulls, Blue Herons and sea shells, then Sandy Key is the place for you. Sandy Key is located on 800 feet of Beach Front. This unit has 1495 SF of living area and a 200 SF beach front balcony. Ceramic Tile throughout Living, Dining, Kitchen and Foyer, Bedrooms are carpeted. Electronics include 40” LCD TV in Living Room, 21" TV in Master Bedroom and Guest Bedroom, and 26" TV in second Guest Bedroom. A NOTE FROM THE OWNERS: Our unit is completely furnished with a generous king-size bed and TV in the master bedroom (complete with walk-in shower!!! ), two full-size beds and TV in the middle bedroom and another queen bed with TV in the third bedroom. 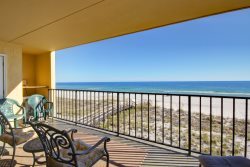 Personal touches abound in this Perdido Key escape including hand-painted beach murals by a local artist. Our one-of-a-kind condo features updated appliances, wonderful seaside breezes, convenience to all the Key has to offer. Sandy Key's amenities are second to none and for those who can't afford to unplug amidst the splendor, WIFI is free. Perdido office staff was always very helpfull when I spoke to them. During our stay we called about one property issue and the maintenance staff arrived quickly and very was also extremely nice. The Sandy Key property has exceeded our expectations both times we have visited. The quality and location of the units for the price can not be beat. We will definitely be back again.